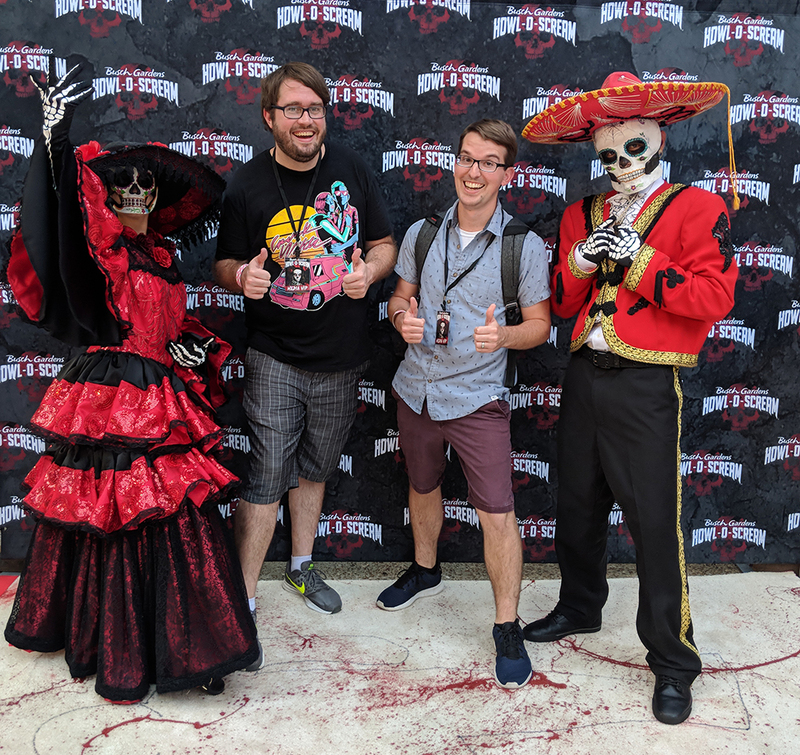 Nick: Busch Gardens invited us to the opening night media party for this year’s Howl-o-Scream, so my good friend Lars and I headed down to Tampa to check it out! 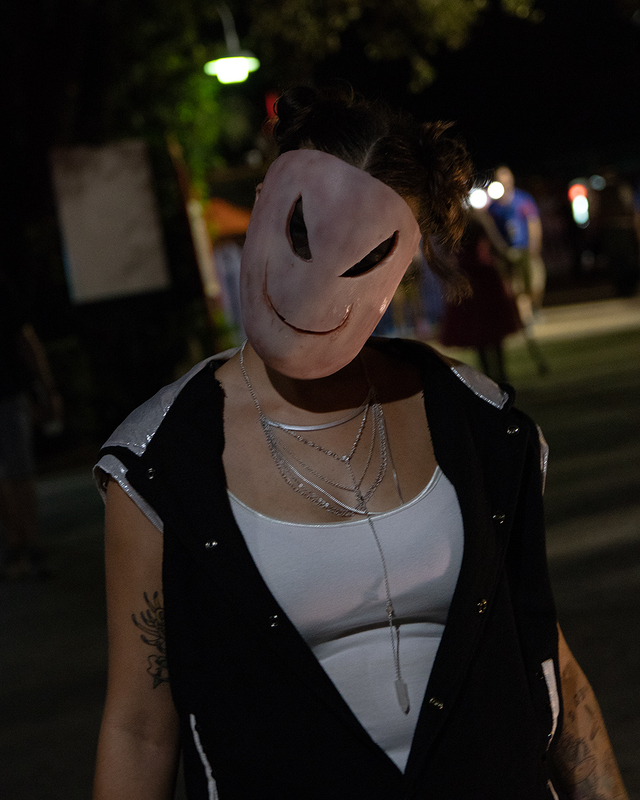 If you’ve read my Halloween Horror Nights review, you already know I love the Halloween season and all the theme park events that come with it, so getting to go to Howl-o-Scream this year was a real treat, especially since I hadn’t been since 2016. So how was the event? Read on to find out! I’ve attended Howl-o-Scream several times over the past 10 or so years, and it’s always a fun event. 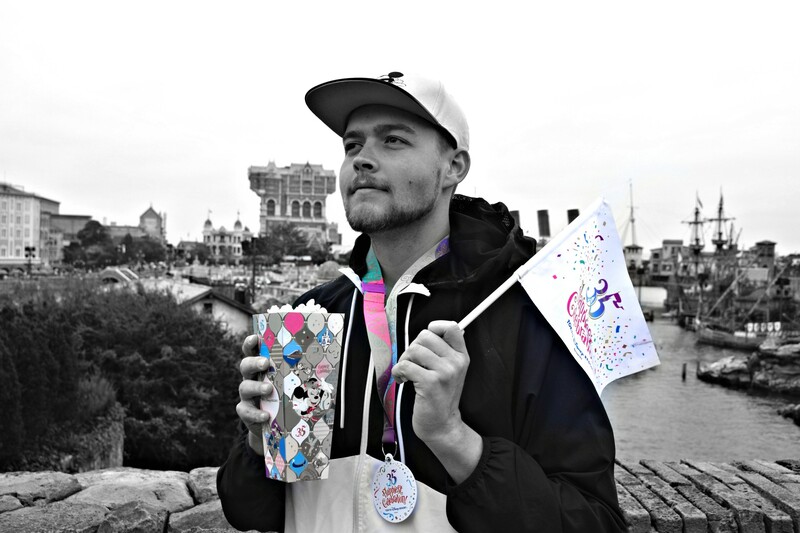 On the surface, it appears very similar to Halloween Horror Nights – you’ve got Haunted Houses, Scarezones, a live show and lots of alcohol. 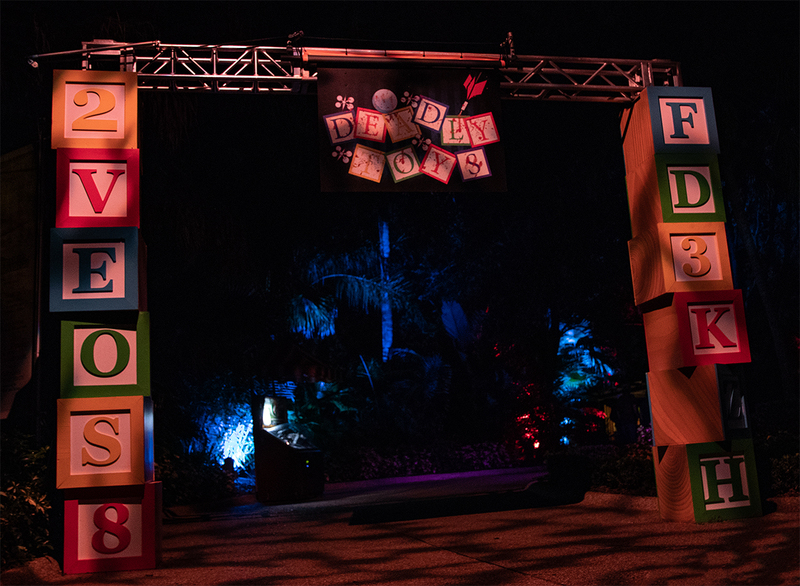 But the event itself feels very different than HHN, and that’s definitely not a bad thing! One of my favorite things about Howl-o-Scream is that they pulse guests though the houses in smaller groups, instead of just sending everyone though in one giant conga line. The scareactors here also rely much more on their voices and props to get their scares, instead of just popping out to a pre-recorded audio cue like at Halloween Horror Nights. I feel like these subtle changes really make the haunted houses at Howl-o-Scream a much more personal and fun experience. 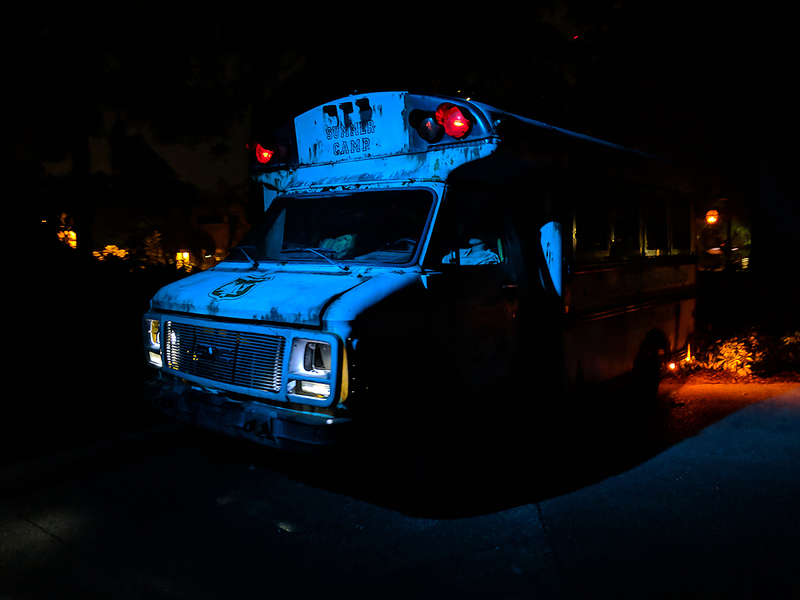 So, let’s get to it – here’s my ranking and thoughts on each of this year’s haunted houses! Motel Hell – This was my favorite house last time I went in 2016, so I’m glad it’s still around, and as you can see, it’s still my favorite house! 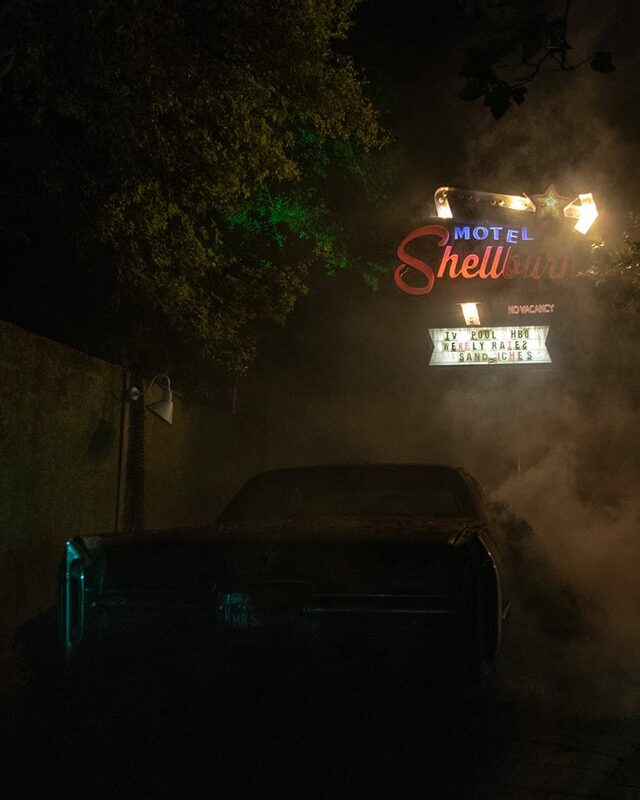 It takes places in an old, run-down motel called Motel Shellburn and has some great sets and unique scares. I especially love the facade/entrance area for this house as well as the “outdoor” Jacuzzi/shuffleboard scene. Insomnia – One of the two new houses this year, Insomnia takes the pretty generic “asylum” theme and puts a bit of a twist on it. Each scene was a different nightmare/fear, and there were some awesome effects. One of my favorites was a scene where the walls literally closed in on you. While navigating though this maze we got lost and disoriented several times, which really added to the fun! Death Water Bayou: Death of the Queen – Another one of my favorite houses from year’s past, this one takes place in a bayou cursed by a Voodoo Queen. It has some pretty impressive sets and some fun scares, like the bungee actors in the swamp scene. This year they added the subtitle “Death of the Queen” to the house name, so I’m thinking it might be the last year to see this house – I guess we’ll see! Unearthed: Search and Survive – I’d been through this house before, but this year they added the “Search and Survive” subtitle name and gave each group a flashlight to help navigate. Apparently, we were on a search team to help rescue the workers who were excavating the area and “unearthed” the old, haunted house. One of the things I really liked about this one is how tight all the scenes felt. Each scene is filled with tons of props and there were some very small/narrow spaces so that claustrophobic feeling helped amplify the scares. I also liked having the flashlight to look around and see some of the cool decor, but it kind of felt pointless and I was afraid of shining it in the actors faces. The Black Spot: Bloodshed – I like this house, but it hasn’t changed much over the years so that’s why I rank it so low on this list. It has some really detailed sets, some interesting scares and the pirate theme is pretty cool, but I definitely enjoyed the other houses more this year. Simon’s Slaughterhouse – This was the other new house this year, and I didn’t really enjoy it too much. It’s billed as a “17+ experience” due to its graphic nature, and while it did feature a lot of gore, nothing seemed too disturbing. The house starts off by splitting your group up into different paths, which would be really cool if they all didn’t just join back together about 50 feet later. Every room had a different “Simon Says” action… “Simon Says Vomit”, “Simon Says Die” etc. All the scenes had very similar set design, so the house got very repetitive very quickly. This year’s event also features six terrifying scarezones, five of which are brand new. 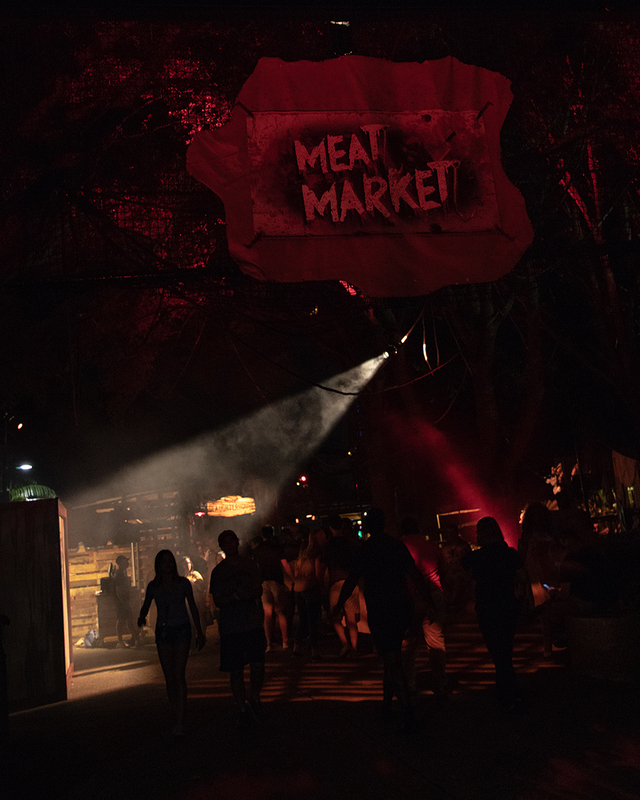 Meat Market is the only returning zone, and it’s located right in front of Simon’s Slaughterhouse, so it provides quite a nice thematic transition into that house. Like Simon’s Slaughterhouse, this zone is also advertised as “17+ recommended” due to the intense gore, but again, I think that’s more of a gimmick than anything else. The five new zones are Maniac Midway, Camp DOA, Deadly Toys, Hell on Wheels and Dia De Los Muertos. They all have pretty generic themes, but each was fun in its own way. My favorite of them was Deadly Toys – it featured several chainsaw wielding demented stuffed animals and other toys you’d recognize from you childhood. Plus, it was located on a long, dark stretch of path which made walking though it that much spookier. Manic Midway and Camp DOA also got several good scares out of me, as the actors like to hide in unexpected places and really blend in well with their props. And of course, one of the best things about Howl-o-Scream is riding all the roller coasters in the dark! We took full advantage of the short lines and rode everything – even my arch nemesis, Falcon’s Fury. 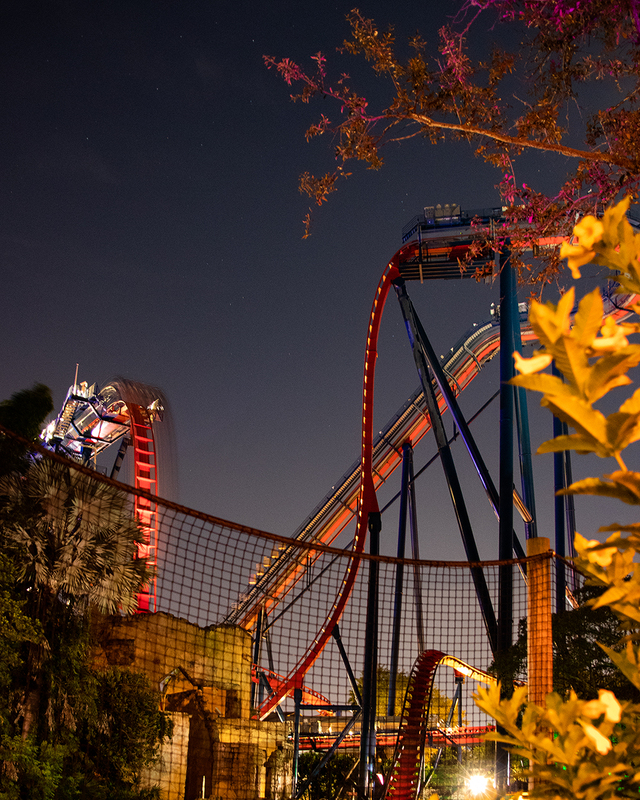 I only snapped this one photo of Sheikra while we were eating, but one day I’d love to head back out to the park when its open late to get some more night shots! Thanks for checking out our Howl-o-Scream review! While you’re here, be sure to check out our other recent Florida articles, and follow us on Instagram and Facebook for more updates and photos!